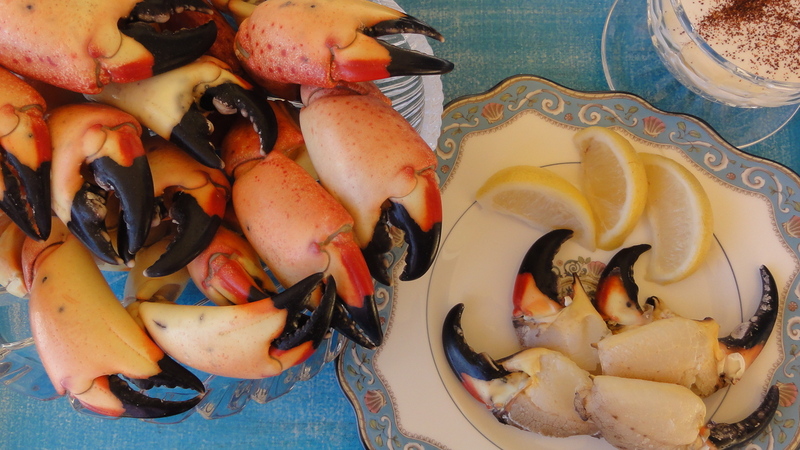 Home » What are Fresh Stone Crabs? Resources > What Are Stone Crabs? Pick any spot like Connecticut, Cuba, Belize, along the entire western Atlantic Ocean or even Texas that lies near the Gulf of Mexico and you are sure to find Florida Stone Crabs on sea shore restaurant menus. Florida Stone Crabs are widely used in the food industry. Everglades City, FL claims to be the birthplace of the famous stone crab industry. This small south Florida town, is located on the western mouth of the beautiful Everglades. Communities all along Florida’s Gulf Coast account for 98% of the stone crab claws in the state. The stone crab season in Florida starts on October 15 and ends in mid-May. Fishing these crabs isn’t permitted for five months each year in order to help sustain this valuable resource. - Stone crabs as well as their hybrids, inhabit estuaries and bays all along the Atlantic and the Gulf Coast. - These crustaceans lie under shell fragments and rocks in the shallow waters along sea shores. - On reaching adulthood, they dig burrows that slant 12”-20” into the ground. - Adult stone crabs are easily recognized by their oval-shaped body and two very large claws (one is typically larger than the other, though not always). - They are dark reddish brown in color with dusky gray spots. - Their claws have shiny black tips and these crabs use them skilfully to defend itself and to hunt as well. - If its claw becomes damaged or if a predator latches onto it, the stone crab can discard the claw. Eventually, the claw does grow back, increasing in size as the crab molts. - Stone crabs have the ability to regenerate their lost appendages. This also means, crabbers can harvest these large claws without killing the creature itself. - As per Florida law, whole stone crabs can’t be harvested. Crabbers simply twist off one/both the claws and put the crab back into the water. In about 18 months, the stone crabs will regenerate their limbs. - The claws need to be a minimum of 2 ¾” in length in order to be harvested legally. - The law also forbids claws to be taken from any egg-bearing females. It is important that the claws be removed very carefully at the correct point, in order that the creature be able to regenerate the lost limb. - Baited traps are used to catch stone crabs. 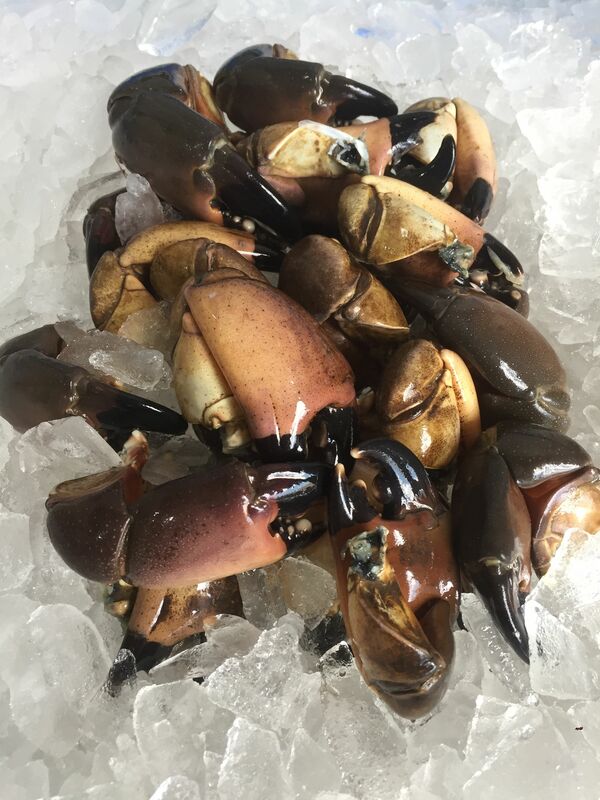 - While you can find stone crabs even as far west as Texas or even in North Carolina, the commercial harvesting of these claws takes place almost entirely in Florida. A large percentage of the overall stone crab harvest comes from areas stretching from Sarasota up to Fort Lauderdale, which is just off the peninsula’s southern tip. - In terms of the dockside value, these are one of the topmost commercial seafood products in Florida. - Florida Stone Crab (M. mercenaria)- The Florida Stone Crab is lighter than the Gulf Stone Crab, has uniformed black spotting on a light tan to pinkish-tan body. It can be found just about anywhere along the entire East Coast of Florida, starting from the Panhandle’s big bend to the southern areas of the peninsula. - Gulf Stone Crab (M. adina) - The darker-toned Gulf Stone Crab has slight mottling across its chocolate brown to maroon colored body. Both of these species’ claws have black tips. Gulf Crabs typically live in the northern areas of the states on both coast. In areas between South Carolina and East Central Florida, the two species have also been known to mate, which has led to the creation of a Hybrid Stone Crab. - Male stone crabs have a lifespan of about 7 years, while females have a lifespan of 8 years. - The larvae feed on tiny floating animals called zooplankton. - Juvenile, as well as adult stone crab, are opportunistic carnivores. However, they may sometimes snack on plants too. - Both adults and juveniles feed on sea anemones, conchs, acorn barnacles, vegetative matter, hermit crabs, blue crabs, boring clams and flatworms. - You can tell if the stone crab claws are original or whether they’re regenerated—by the faint fingerprint-like markings on the pincer’s last segment (propodus). If there is no break in the fingerprint-like lines, it means you have an original claw. On the other hand, if there are breaks in the lines, it means the claw is a regenerated one. - As a Florida stone crab ages, the overall percentage of body weight might increase in its claws. Sometimes, almost 50% of the body weight of older male crabs can be in their large claws. - Florida stone crab has a huge crusher claw. The pincer claw is smaller and has several small teeth it uses for cutting. - Seashells are very useful tools for stone crabs. They utilize these shells to dig & burrow to create their home near docks, rocks and among the seagrass in shallower waters. If you see piles of shell pieces near holes in rocks & reefs, that might be a good indication that you’ve stumbled upon a Florida stone crab’s home. These crabs come in various size grades based on their weight: medium, large, jumbo and colossal. About a pound of stone crab claws will typically feed one person. The claws are dunked in boiling water right after being harvested, either at the dockside or on the fishing boat itself. This helps prevent the succulent meat from becoming stuck to the shells’ inside. Stone crab claws are sold either frozen or fresh cooked. They are popularly served on a bed of crushed ice with a side of mustard dipping sauce. However, many people also relish them hot with a drizzle of lime juice and butter. The sweet, firm and succulent meat tastes very similar to lobster. It is low in fat, extra lean, and an excellent source of protein. Fresh-cooked crab claws should ideally have a slight sea-breeze aroma. It’s important that you store them at 32°F in the coldest section of your refrigerator. Make sure you consume them within two days post purchase. If the stone crab claws that you’ve purchased have absolutely no cracks in the shells, you can safely freeze them for up to 6 months. Tip- Before use, you’d have to thaw these claws on your refrigerator shelf for at least 12-18 hours, which means preparation takes some pre-planning. If you attempt to thaw them at room temperature or under running water, that will have a negative impact on their texture and taste. To crack its shell, use a good crab cracker (you can easily find these at any department store or kitchen supply shop), but the back of a very heavy spoon will work as well. Remove all the cracked shell pieces, and leave the meat attached to the crab’s moveable pincer. You also have the option to pick the meat from the claws and use them in stews, soups, salads and other dishes. About 2 ½ pounds of cooked crab claws yield almost 1 pound of meat. 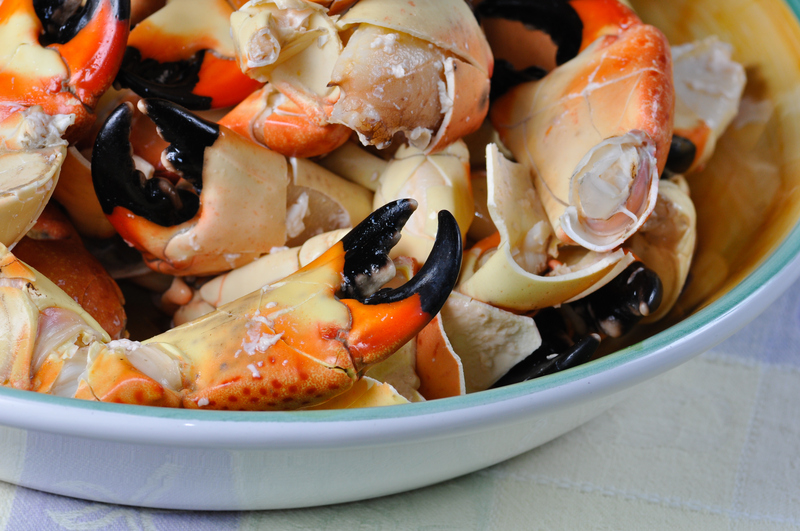 While most crab types are served whole, Florida stone crab claws are generally prepped exactly like shrimp cocktail; they are cooked and cracked before being served like meaty finger foods. A creamy mustard sauce does justice to its naturally delicious flavor. 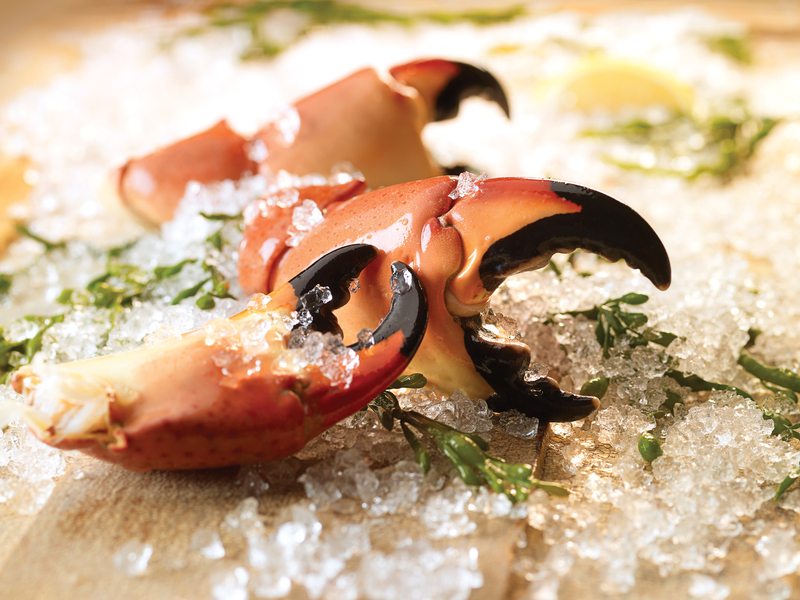 We at Fresh Stone Crabs are the suppliers of the most succulent and delectable stone crab claws. We offer overnight delivery of our products throughout the U.S.